Earth Glue is an environmentally friendly acrylic polymer. It is added to water and when applied it will penetrate the soils and bond them together creating a tough layer of protection. 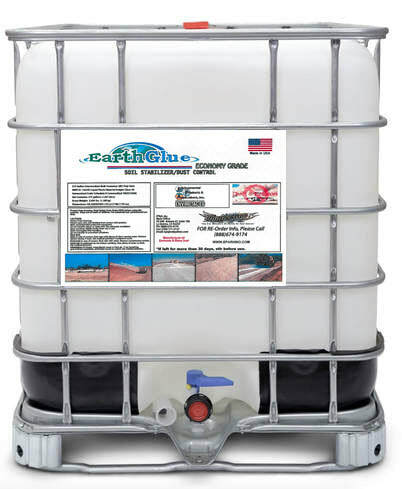 Earth Glue is a recycled product from the polymer industry that has been reworked to serve the dust control and soil stabilization sectors. It will outperform salt based and lignin products traditionally used for dust control on roads. This is the lowest cost polymer product used for dust control/ soil stabilization on the market. It was developed to compete with salt based products and not only does it outperform them it is roughly the same cost or many instances cheaper. It is also more environmentally friendly, than not only salt based products but other traditionally used products.